As promised, Google started to roll out the offline version of Google Docs, but don't expect too much. Much like the offline Gmail and offline Google Calendar, Google Docs works offline only if you use Chrome and install an app from the Chrome Web Store. When you're offline, Google Docs shows a simplified interface that only lists the documents and spreadsheets that are cached. 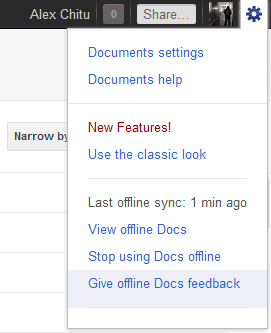 You can only view them, so most of the features from Google Docs menus are disabled. Just like the offline Gmail, Google Docs uses a different interface that can also be accessed when you're online if you go to: https://docs.google.com/offline/. "Offline access is available only for documents and spreadsheets. When you have Google Docs open and have an Internet connection, your most recently opened documents and spreadsheets will sync and become available offline. Presentations, drawings and other items are not currently available offline," explains Google. Another downside is that you can't edit your documents and spreadsheets, a feature that was available in the Gears implementation. 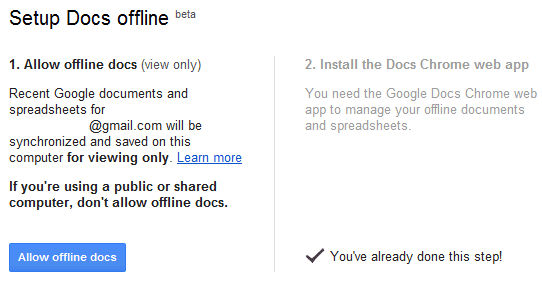 Right now, offline Google Docs is very limited and can only be used to access some of your documents and spreadsheets. It's interesting to notice that the apps powered by Gears were a lot more powerful and worked in other browsers: Firefox, Safari, IE. Maybe Google shouldn't have deprecated Gears and disabled the features that used Gears until the HTML5 implementations were good enough. Don't see it yet here in the east, but very good news. This is an enormously complex undertaking, so I can understand the very slow and cautious implementations. Another couple of years before it's probably all ironed out. But you know, it's still free software. I am actually glad to see how slowly and carefully they seem to be re-implementing offline access. My experience with offline Gmail and Docs using Gears was just awful. Even when online, the component often made my web application completely hang. I probably could have sorted out the problems somehow, but after a few weeks of trying I just gave up on it. In contrast, offline Google apps on my Android phone have been flawless, right from the start. *That's* the experience I want on my desktop, and I'm happy to wait for it to be implemented. Thanks for your coverage of the progress - much appreciated! This is indeed a very compelling feature. But I hope this time they're not going to disable this feature after everybody gets used to it, as they did last time! Looks like I don't get the offline option on my Google Apps account but do on my Gmail account. That sounds about right. +Alex, I definitely hear your point about waiting to disable gears until the HTML5 option was ready. 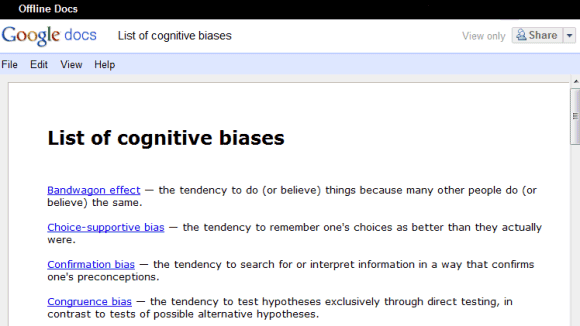 What do you think are the chances Google partly wanted to drive Chrome adoption? +Shannon, I enjoyed your insights and additional perspective -- thanks for sharing. Interesting but not the best solution. It is probably easiest to set up local google doc synchronization using http://www.syncdocs.com/ and just edit your local copy. when you rejoin the net, things true up automatically. As I am sitting here unable to get at my DOCS with absolutely no response from docs.google.com I suppose this will be a must-have feature. But I really would prefer to be able to rely on the primary service. The irony of this release when Docs has gone down! frankly speaking i rarely use Google docs, maybe because the interface is not quit captivating enough..
Google should make some improvement to match site like scribd , docstoc etc.. The gears version not only was supported by more browsers, but also provided a better functionality, but at least it's back.